In 2 Cor 11 Paul boasts about his sufferings as a Christian and as an apostle. In the Pauline concept of boasting about your sufferings, the intention is not to complain or to dwell in your own misfortune; but really to extol the extent of God’s mercy and glorify God – if you live to tell the tale of your great suffering, then God must be good! Paul unashamedly admits that his sufferings as a Christian has been far greater than others [2 Cor 11:23] – but amidst all his recounts of near-deaths and dangers and toils; he speaks of one unique difficulty – the immense pressure of his care for all the churches. In this study, we will take a curious look at this pressure and compare it to the pressure we would normally face in our daily lives today. Besides everything else – Prior to this verse Paul had spent a few verses to speak about his hardships as a servant of Christ. In some translations, for example the KJV – Beside those things that are without – and many different renditions from the various translations seem to suggest that Paul here means to say, besides what I’ve mentioned, and all that I’ve not mentioned – hence suggesting that there are a lot more hardships that he has faced that’s not on the record. I face daily the pressure of my concern for all the churches – Without doubt, Paul has ties to plenty of churches in that era. He personally set up many, and also served as the spiritual father to some churches that he did not set up, but lacked a spiritual leader. However, Paul didn’t just say all my churches; or all the churches I’ve been to – or anything like that. He said, all the churches – which really mean the entire Church of Christ as a single body, the entire spiritual climate, the whole outlook of all the followers of Christ. That was what he was daily concerned about, indeed, as one of the frontrunners of the early day Church, Paul – along with the other apostles, held great responsibility in the Christian world. As an apostle, and as a missionary, he was daily plunged deep into the issues of the churches – the majority of his letters recorded in the Bible were written directly to churches. He was also considered to be the apostle of the Gentiles, and was fully involved in planting them, raising them, and preaching the gospel to them. Many of them were spiritual babies who frequently required his watch and care. The constant struggles between the Jews and the Gentiles within the churches, added on to the constant threat of the false teachers, also meant that the churches needed constant teaching in order to not be swayed and so that their faith will not waver or be lost. In Colossians 2:1, Paul hints of the pressure he faces – I want you to know how much I am struggling for you and for those at Laodicea, and for all who have not met me personally – even extending to people whom he had yet to meet! The greater the need, the greater the pressure. The more urgent and pressing the issue, the greater the pressure. 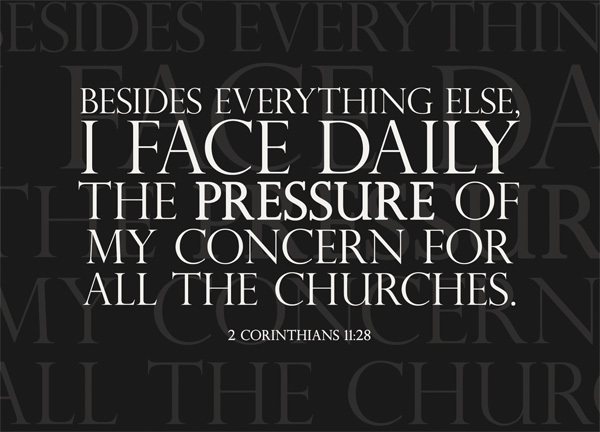 Paul described it as a daily pressure, and I’m sure he wasn’t exaggerating – because the needs of the churches are constant and happen everyday, the pressure is present everyday. Most church leaders and missionaries will probably understand Paul very well – the daily pressure of concern for your church, and for the brothers and sisters in your church. Pressure will come, even if it is good work in Christ. We face pressure from just about every matter of consequence that we engage in life – pressure will definitely always be with us, the only issue here is, how do we face up to these pressures? We don’t have to be a church leader to face pressure. Often, in our jobs, in our family life, in our friendships, or even in our ministries and service in church, there is pressure. Sometimes, pressure is self-induced; other times, pressure is inflicted by others. Can pressure be considered as a form of suffering? I’d like to think so. Paul mentioned it in his list of toils too. I’d like to think that pressure, or stress, when not dealt with properly – which is most of the time – is suffering. Pressure is hard to bear. The greater the pressure, the harder it is. Assuming that pressure is suffering, then there is only one way to deal with it – turning to God for deliverance. In many places in the world today, where the pace of life is fast and the quality of life is high, people live in constant pressure. The higher you climb, the greater the pressure. One of the best ways to tell the character of a person is to look at how he or she copes with pressure. I’m one of those who believe that pressure is good, as it forces and squeezes some motivation out of you. Yet, as with sufferings, if you fail to bring God into it, if you do not turn to God about your pressure, it will easily escalate into desperation or even depression. Stress is also the cause of a number of ailments, major or minor. Even if you pray, even if you turn to God, it is more likely than not that your pressure will still be there. It’s like suffering – it doesn’t mean that if you pray, you won’t suffer. To put it simply, with or without God, you will face pressures – it’s just that with God, we somehow gain the strength to cope with our pressures. We gain the superhuman ability to go through 3 shipwrecks, numerous near-deaths and beatings, like Paul, and still be able to boast about our sufferings and glorify God’s name. It is good to be concerned for the church. We need to be concerned with our churches. If you face pressure because of your church, chances are, somebody or something has a need that you can help with. We probably don’t have a long string of churches to be concerned over, like Paul did. Just for our own church, let us be concerned, let us show care and love, let us pray and be anxious. It is our church after all.